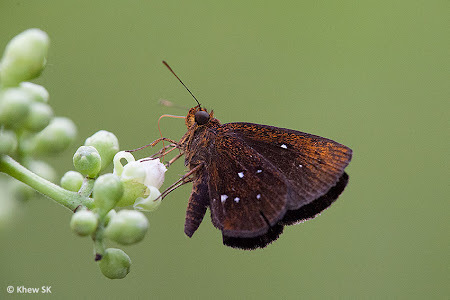 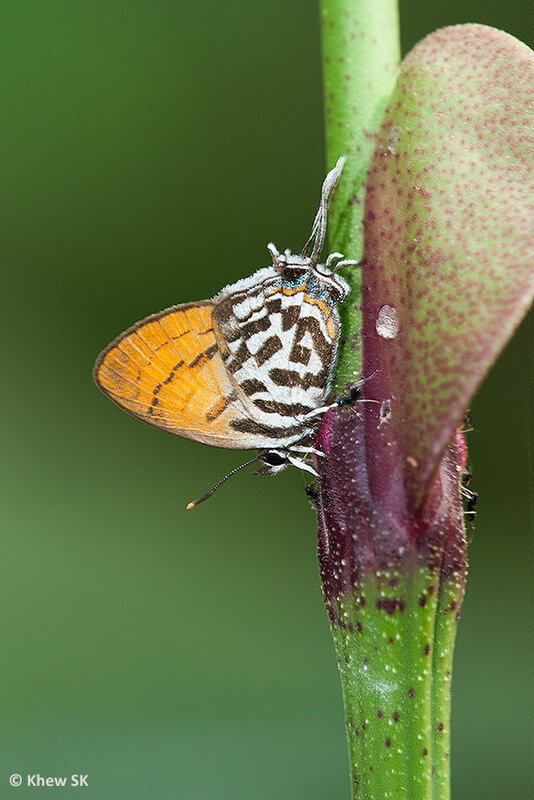 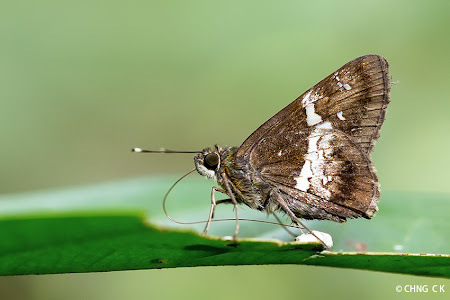 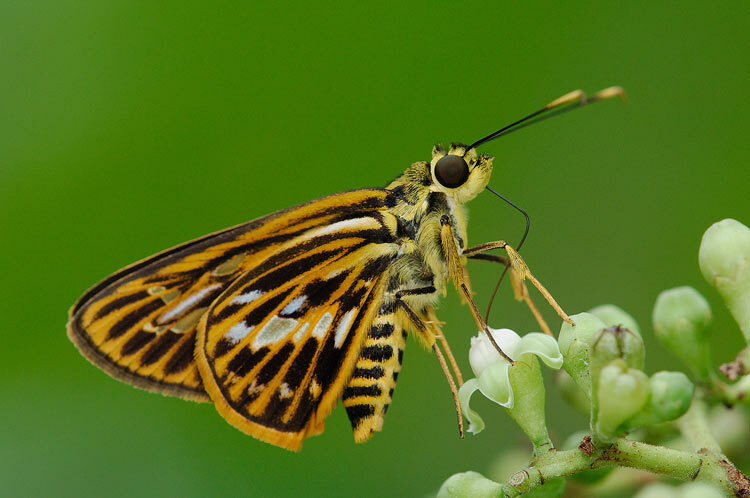 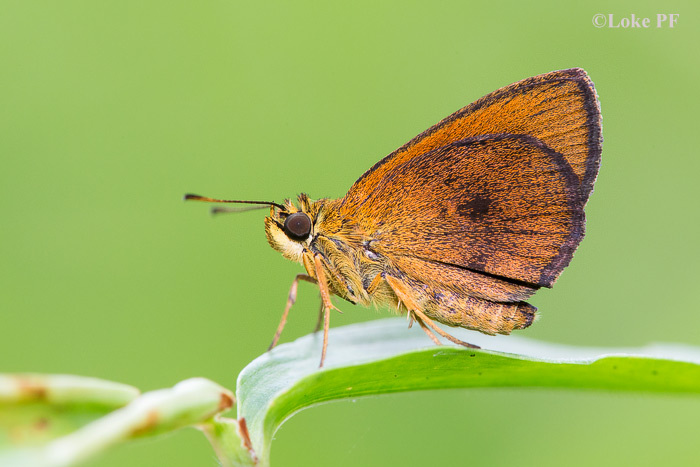 This moderately rare skipper is forest-dependent and is usually encountered in the nature reserves in Singapore. 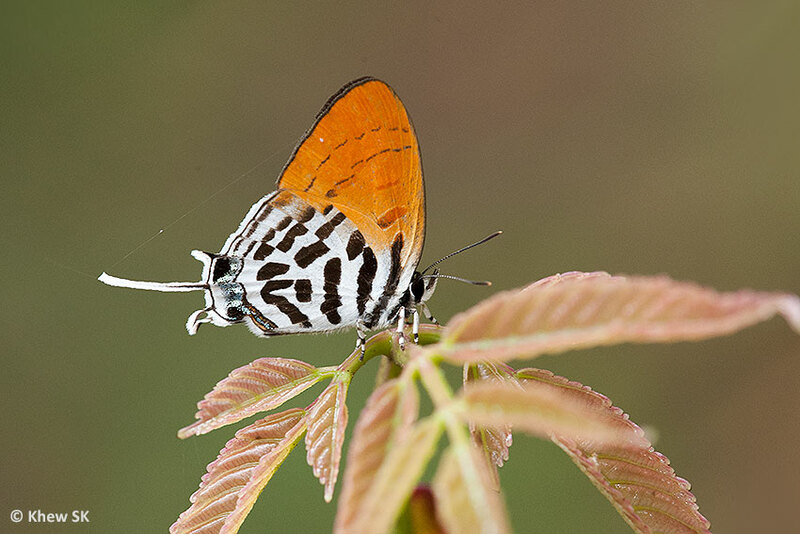 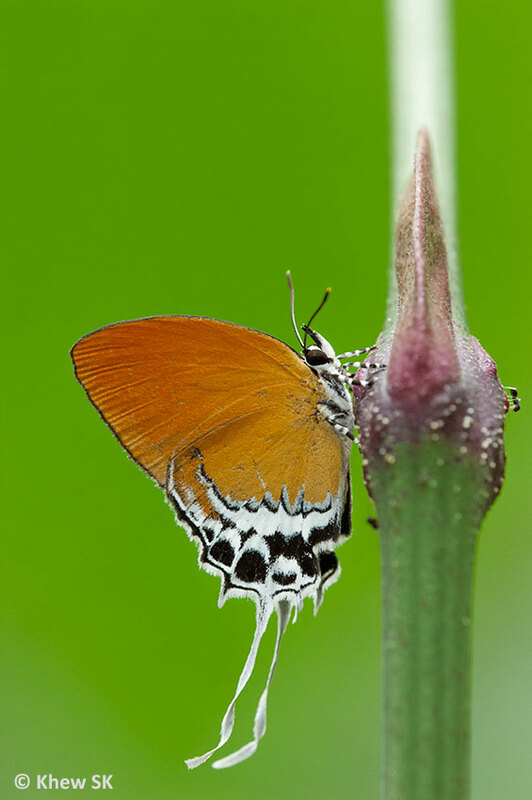 It is a fast flyer and flies rapidly between flowers when feeding on nectar. It tends to remain at low level, flitting amongst the shrubbery but when alarmed it can take off in a flash to the treetops to get out of harm's way. 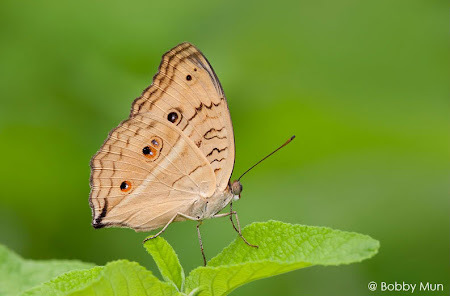 The Tree Flitter is dark brown above with hyaline spots on the forewings. On the underside of the hindwing, there is an irregular white discal band from mid-costa to mid-dorsum. The hindwing cilia are chequered. 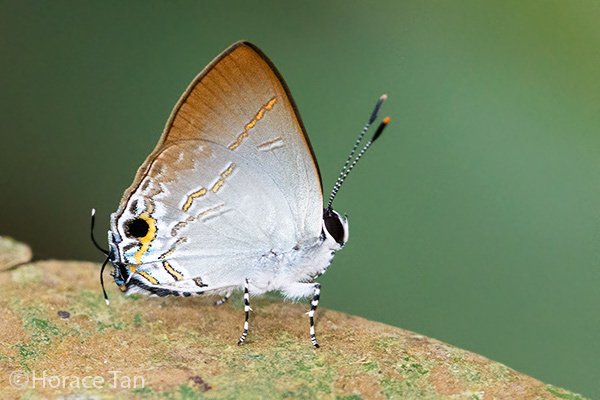 The antennae are white-banded just below the elbow of the apiculus. 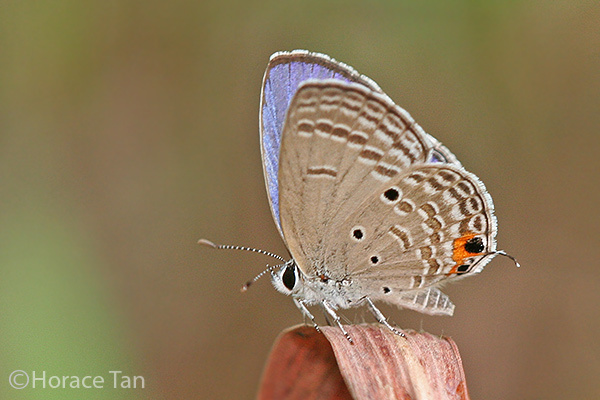 This individual was photographed by ButterflyCircle member Chng CK in the nature reserves. 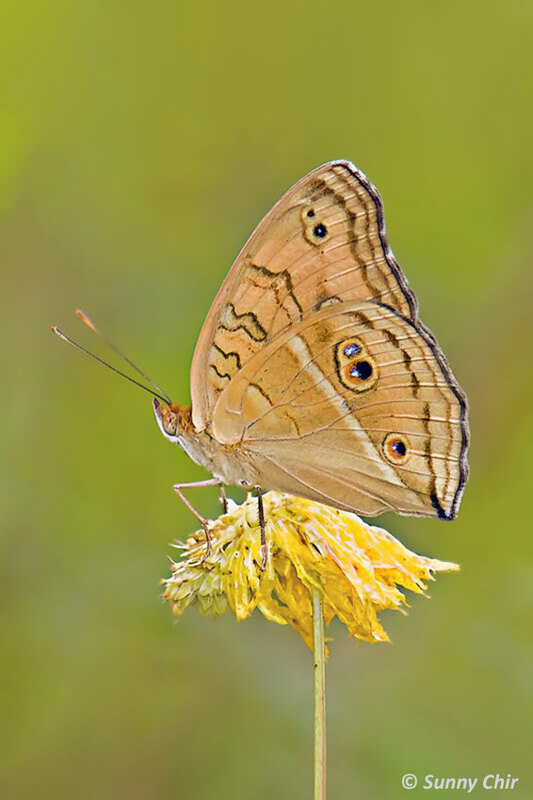 In Greek mythology, the Psyche is often depicted as a princess who was loved by Cupid. She became the personification of the soul. The word psyche also means the human soul, spirit or mind, from which the medical specialty psychiatry is derived. 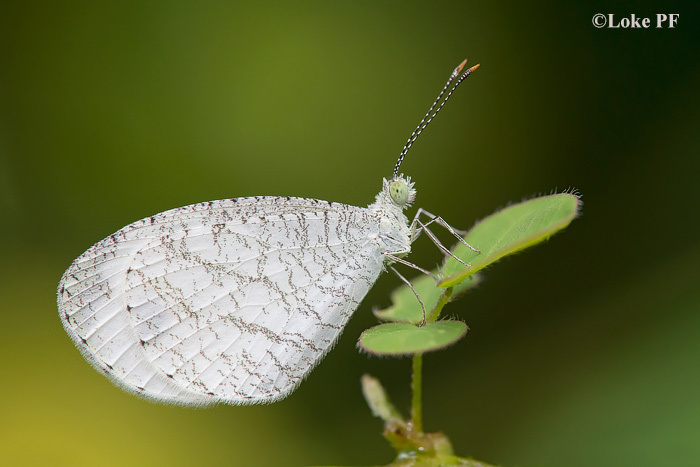 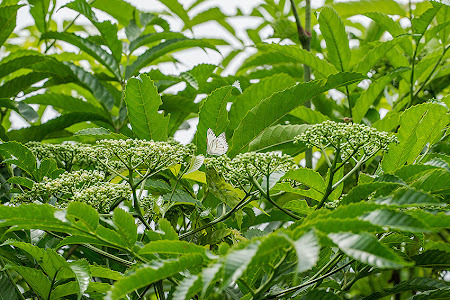 In the butterfly world, the Psyche is a small white and delicate butterfly that flies gently and restlessly amongst low shrubbery and open areas. 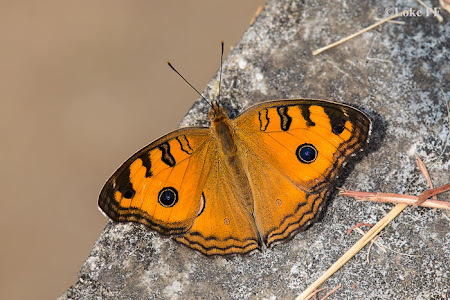 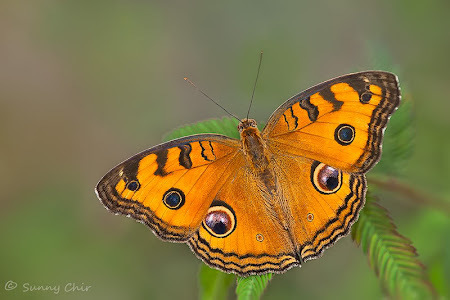 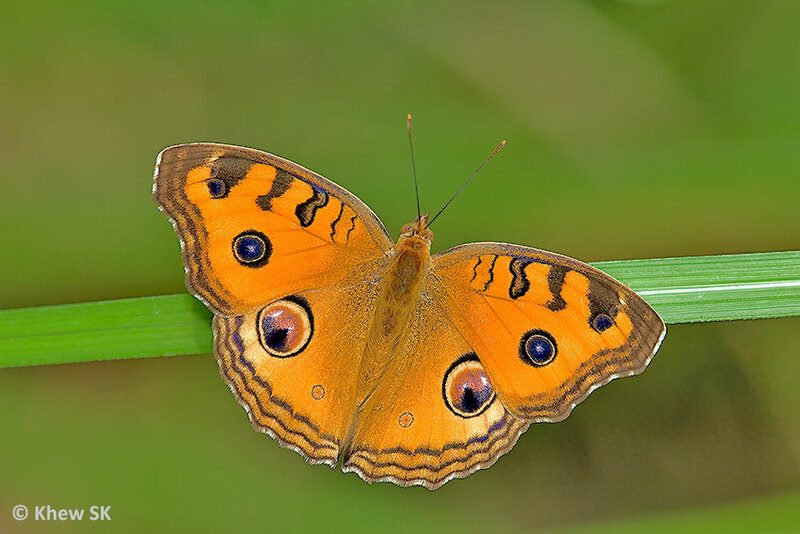 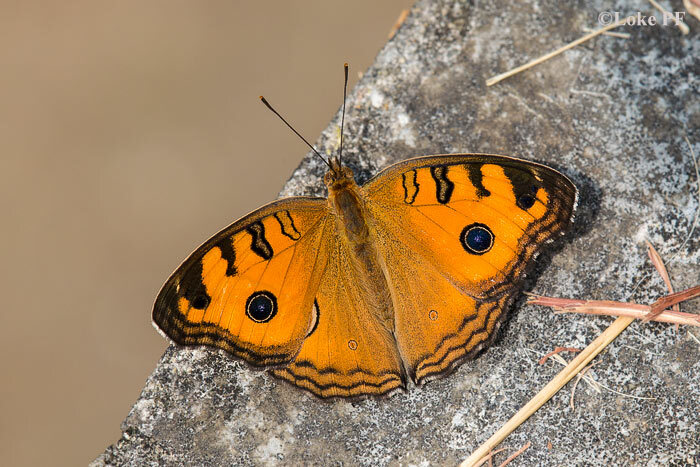 The Psyche is white above, with a black apical area and a large black oblong sub-apical spot on the forewing. 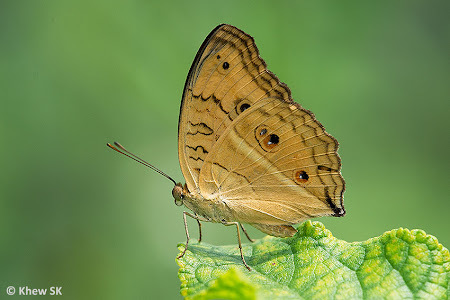 The underside is white and features greenish streaks across both wings. 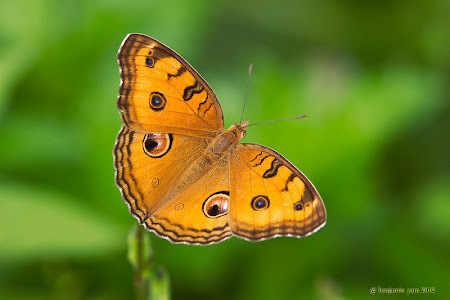 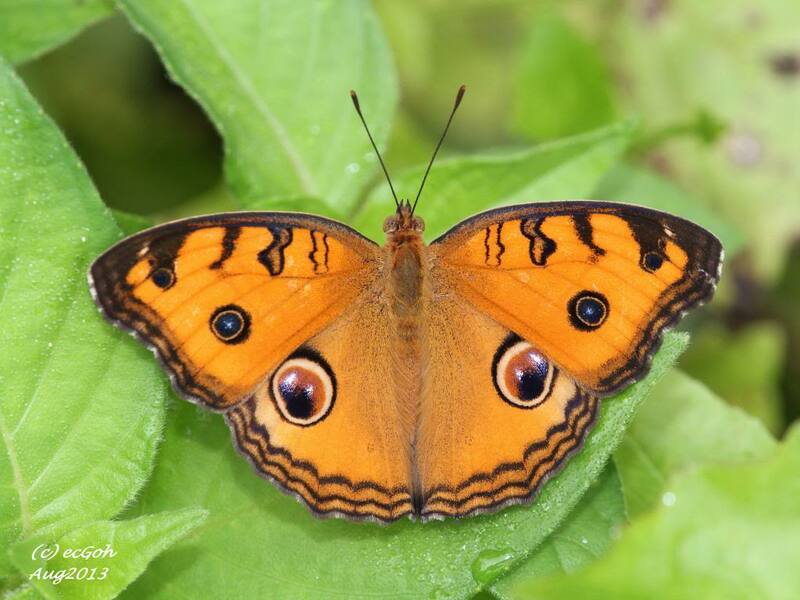 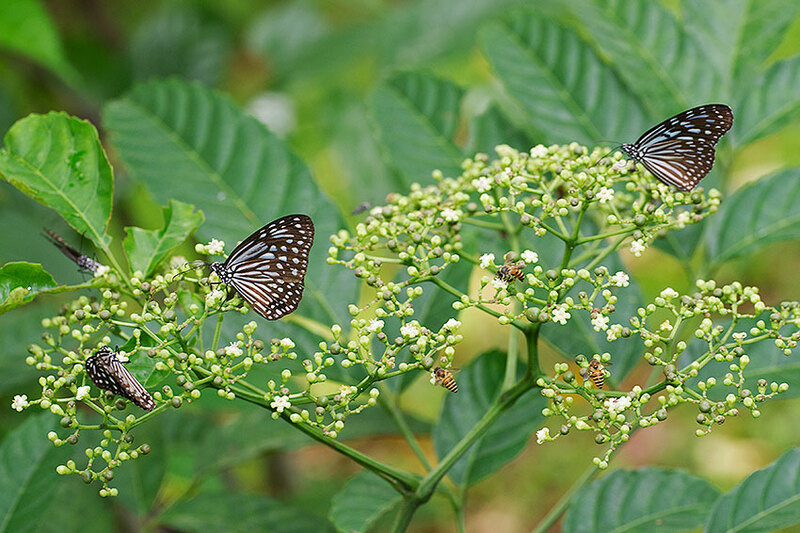 This shot was taken by ButterflyCircle member Loke PF at the Butterfly Hill at Pulau Ubin last weekend. 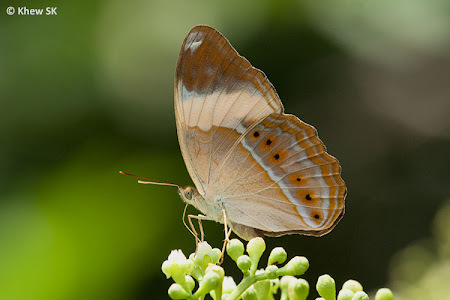 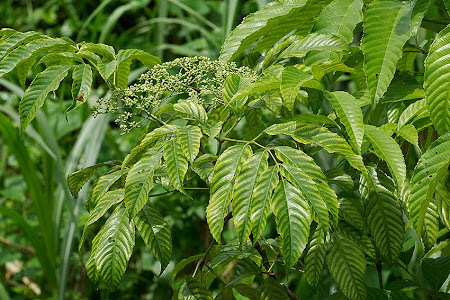 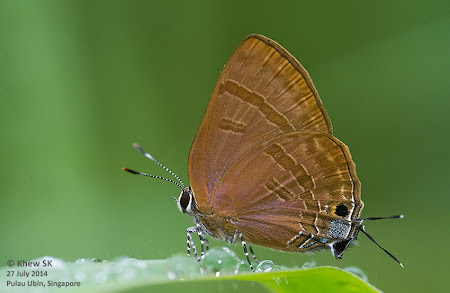 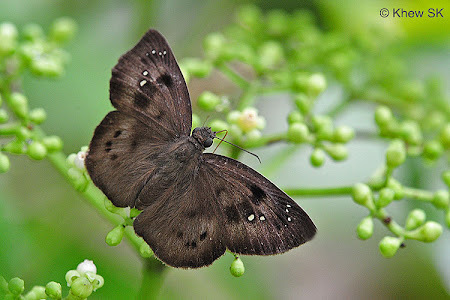 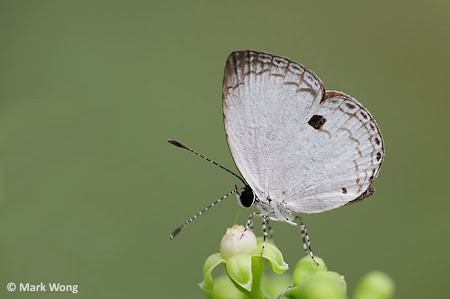 The Indigo Flash is a moderately rare species that has a rather wide distribution, turning up in forested areas as well as urban parks and gardens in Singapore. 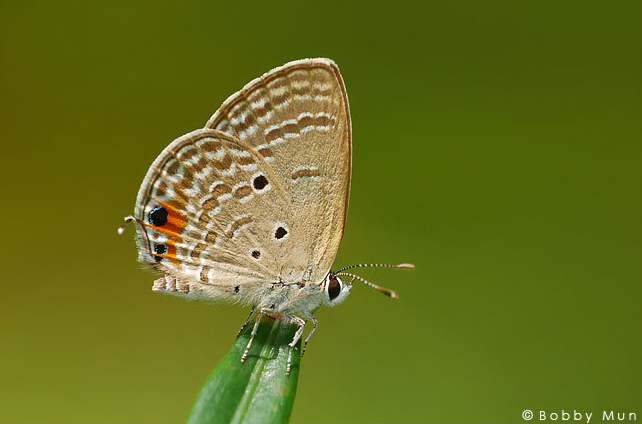 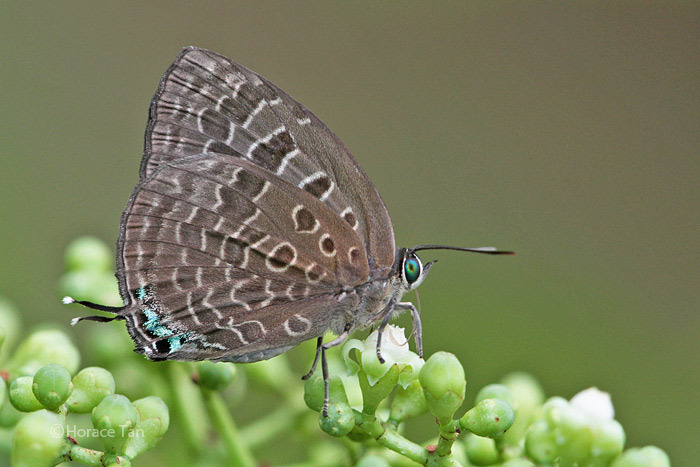 Both sexes of this species feature deep blue or bluish-green uppersides. It is a fast flyer and sometimes flies and hides on the underside of a leaf when disturbed. 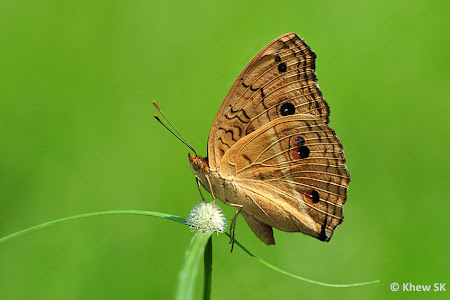 On hot sunny days, or in the early morning hours, it can be seen sunbathing with its wings opened flat on the top surfaces of foliage. 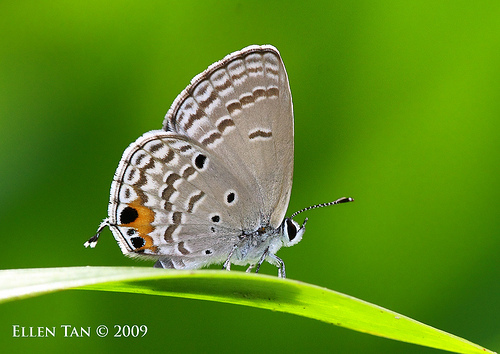 The male is indigo blue above and unmarked, whilst the female is a steely-blue and similarly unmarked. The underside is dark brown with broad post-discal bands. 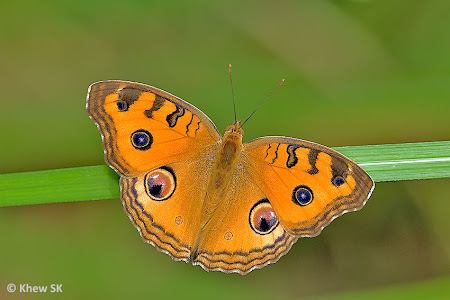 There is a strong purple wash on the underside of both wings - more prominently in the male than in the female. 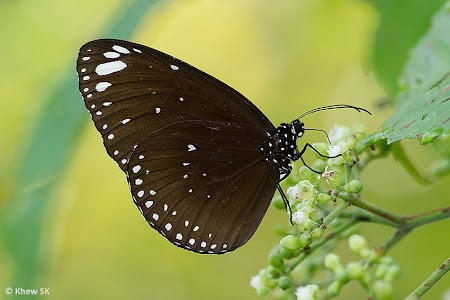 This female, shot last weekend at Pulau Ubin's Butterfly Hill, appeared to be a newly-eclosed individual and was cooperative for awhile during the early morning hours after a rainstorm. 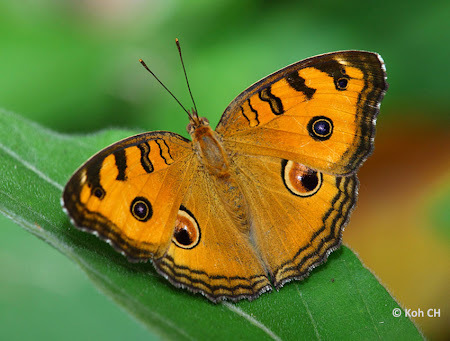 Caterpillar Local Host Plants: Cycas revoluta (Cycadaceae, common name: Sago Palm), Cycas rumphii (Cycadaceae). 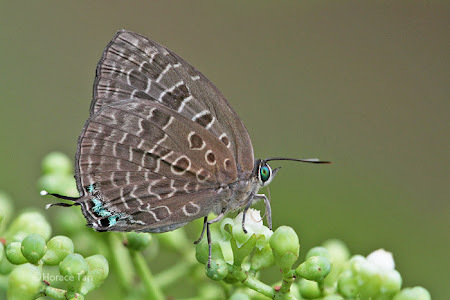 On the upperside, the male is blue with thin black borders on both wings and it has a black tornal spot on the hindwing. 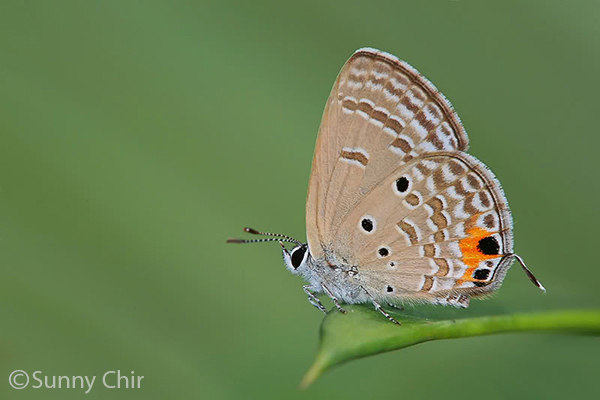 The female is in paler blue with broad borders on the forewing and it has a series of submarginal spots on the hindwing, of which the spot in space 2 is crowned in orange. 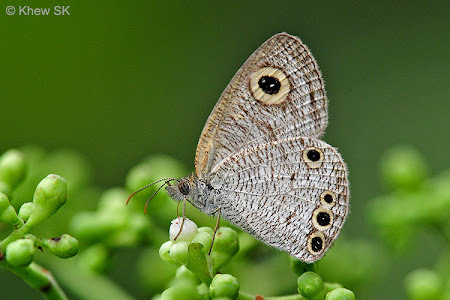 On the underside, both sexes are pale greyish brown. 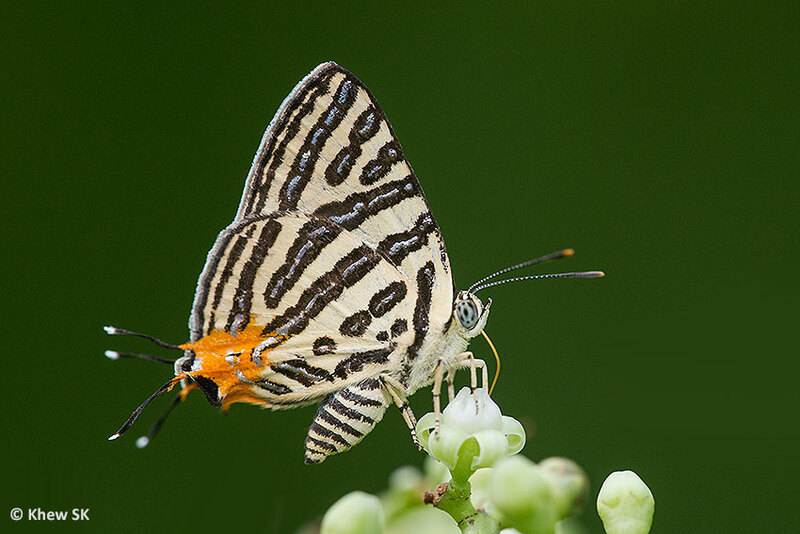 Both wings have the usual submarginal, marginal and post-discal series of spots and cell-end bars flanked with white. In the hindwing, there is a black spot in the cell, two black spots in space 7, another one just below vein 1a and orange-crowned tornal spots in spaces 1b and 2. 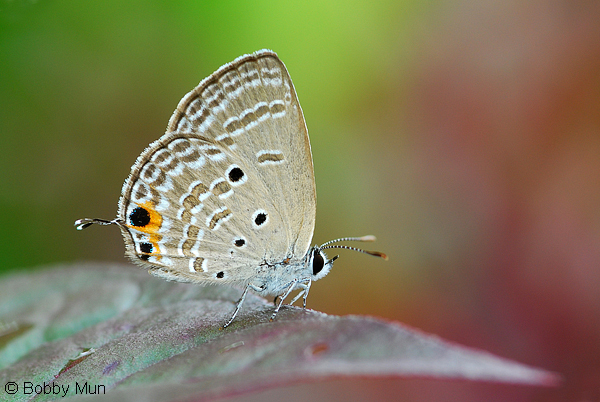 There is a white-tipped filamentous tail at vein 2 in the hindwing. Cycad Blue is common in Singapore. The adults are usually observed flying in the vicinity of its host plant, the ornamental Sago Palm which can be found in many gardens in commercial, recreational and private residential areas. 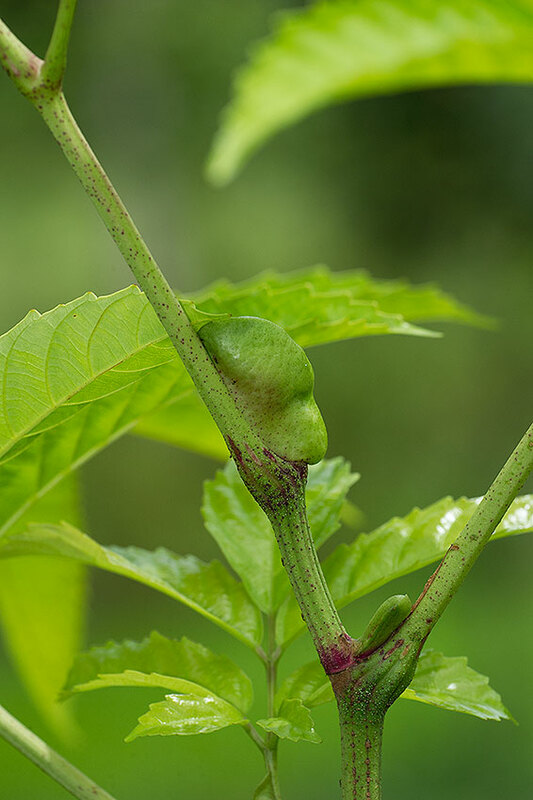 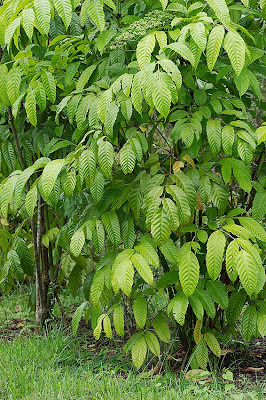 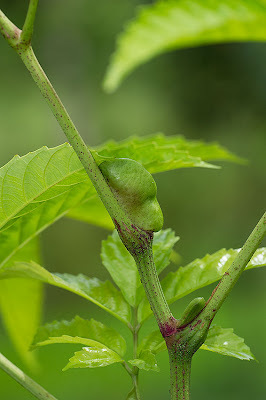 They are viewed as a pest by gardeners as their presence usually leaves the prized ornamental plants without new growth. 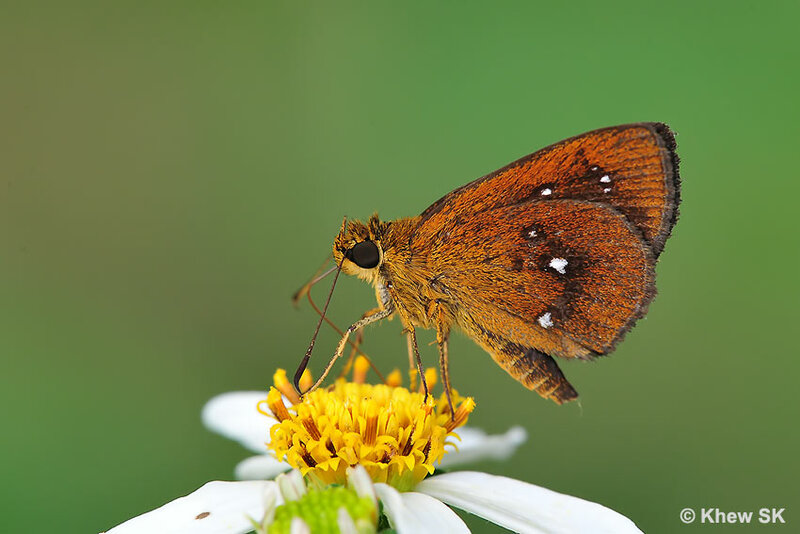 The adults visits flowers for nectar and have the habit of sunbathing with open wings in sunny condition. 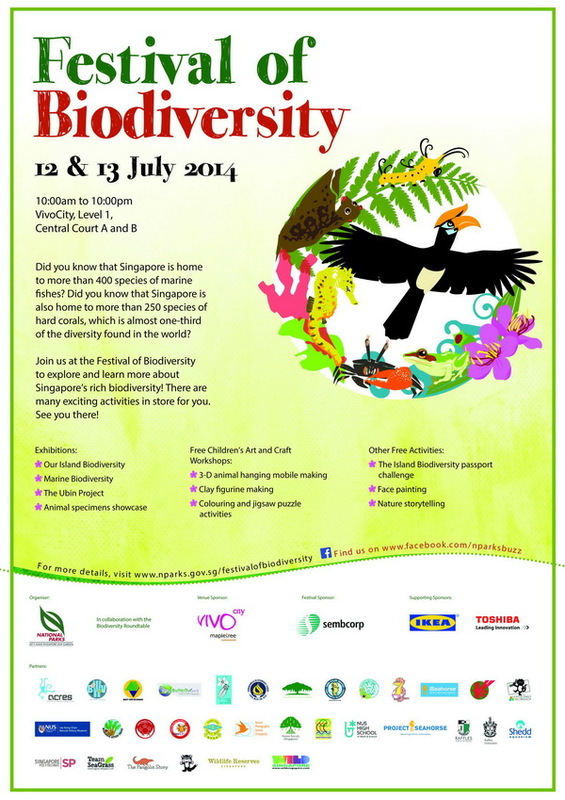 ButterflyCircle @ Festival of Biodiversity 2014! This year, the 3rd Festival of Biodiversity returned to VivoCity mall after last year's well-visited event, also held at Singapore's largest shopping mall. 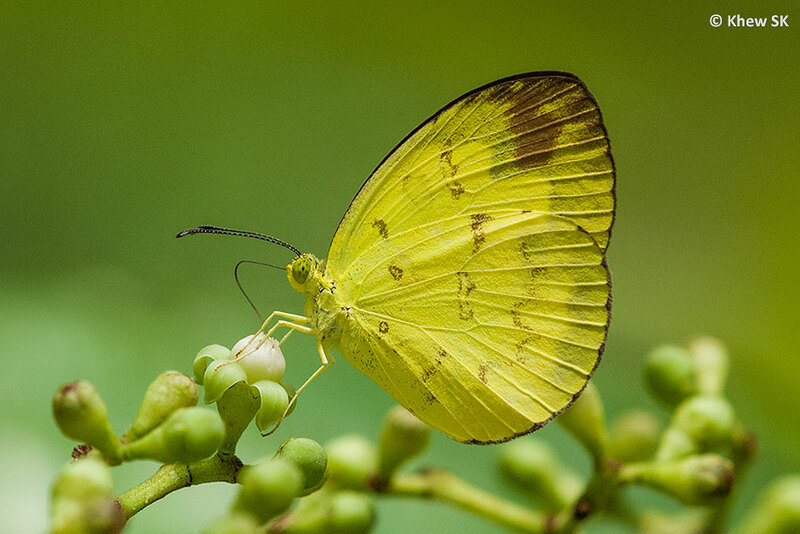 Occupying a larger footprint than the previous year's FOB, the 2014 festival promised to be an even bigger showcase of Singapore's rich and diverse biodiversity. 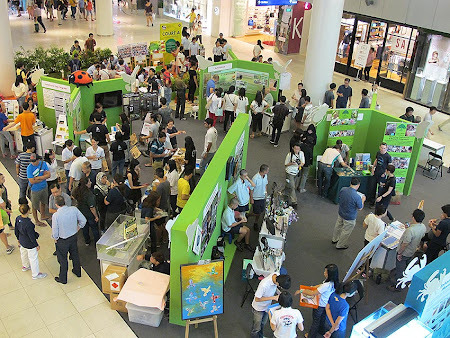 With all the participating members of the Biodiversity Roundtable and several new groups added, each partner group had an individual booth exhibiting its members' work and featuring its contributions and playing its part in the showcasing and conservation efforts of Singapore's biodiversity. This year, ButterflyCircle decided to do a collage of our members' work on three large A0 boards, which also described the objectives of the group and its activities. 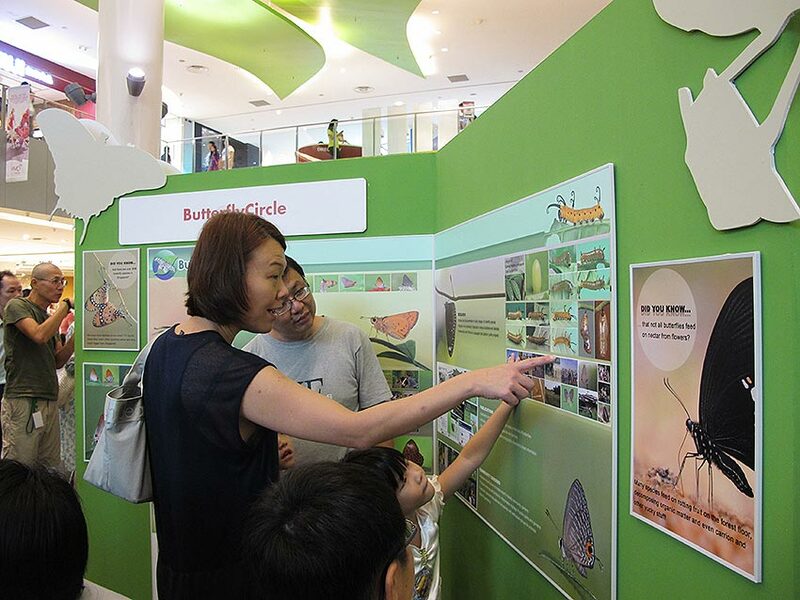 There were also smaller boards that provided additional snippets of information about Singapore's butterflies. 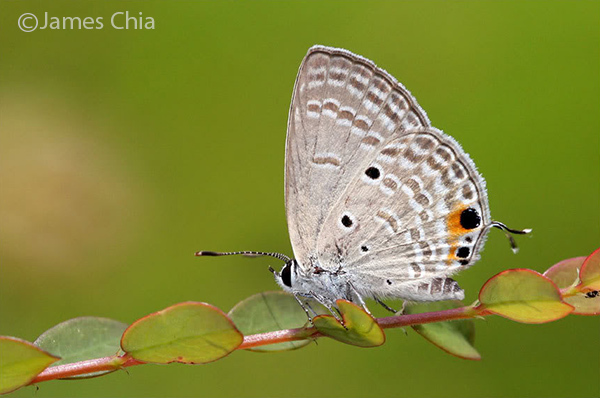 The work of collating the photos and putting together the boards was again ably done by our enthusiastic lady member, Huang CJ, assisted by the intrepid twins, Mark and Anthony. 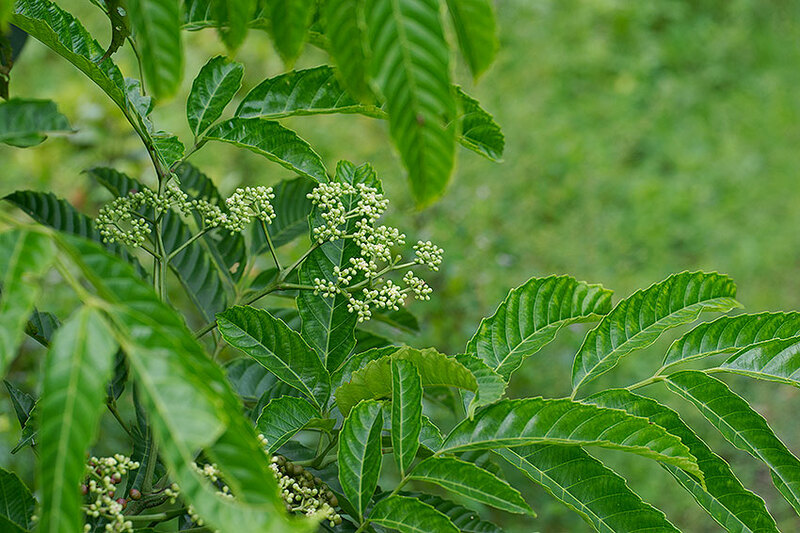 Once again, CJ has to be congratulated for assembling the awesome presentation boards that was informative, educational as well as pleasing to the eye. The day started very early at 7:15am when ButterflyCircle members CJ, Eng Chuan, Anthony, Jerome and me reached VivoCity. The booths had already been set up the night before, and everything was ready to receive the boards. After a quick discussion the group set about Velcro-ing the boards and sticking them up on the panels. 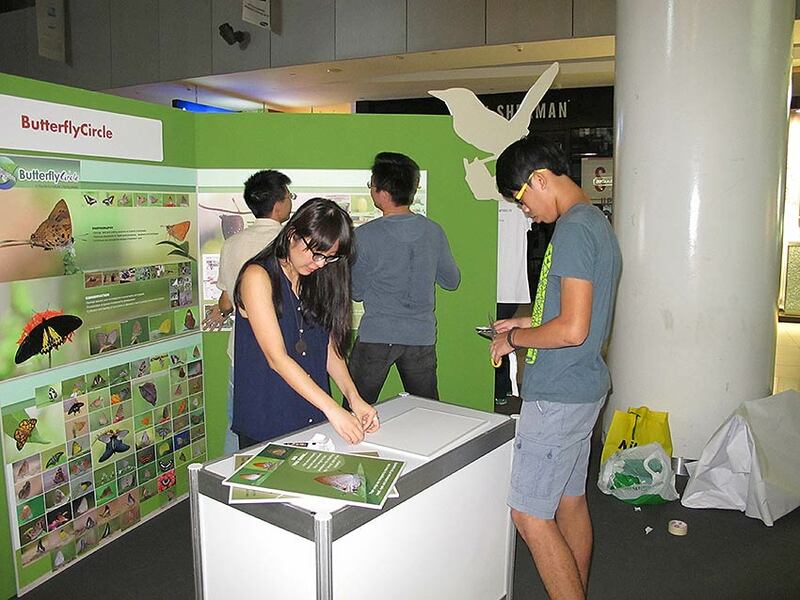 It was efficiently put up and many hands made light work of setting up our booth. 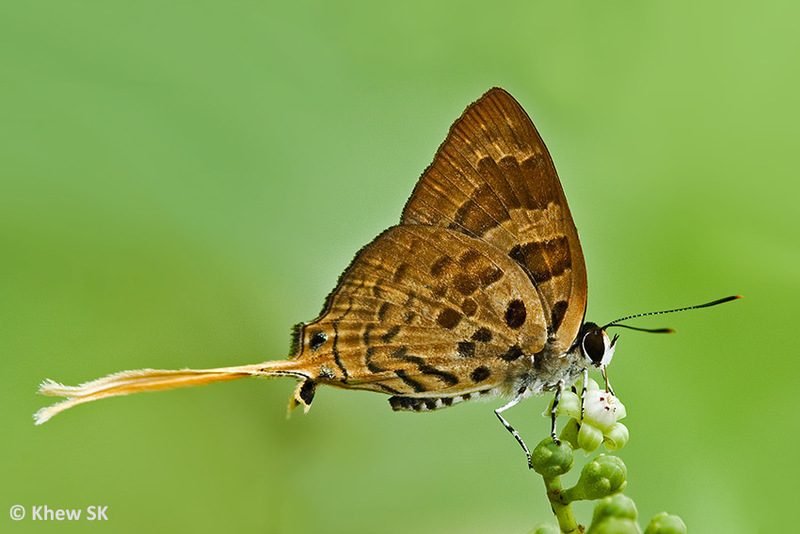 Everyone had a sumptuous breakfast at Yakun Kaya Toast after that! 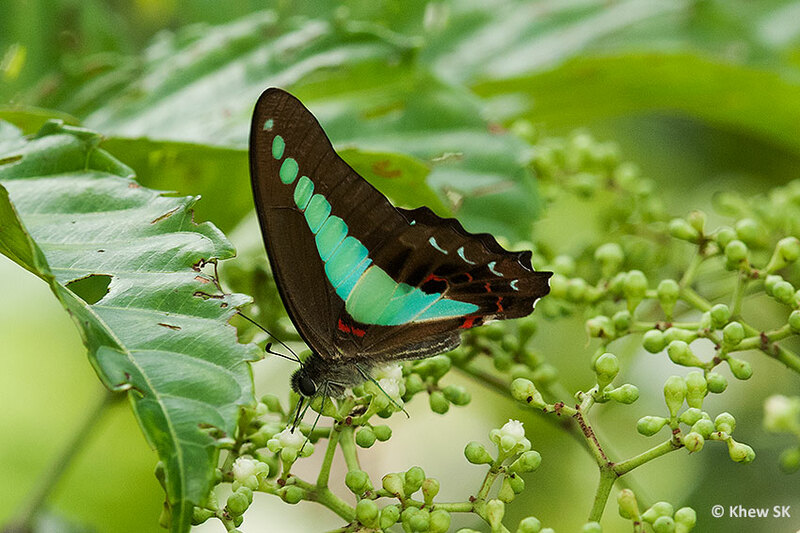 The Festival of Biodiversity is an annual event organised by the National Parks Board (NParks) that showcases Singapore’s impressive and unique array of island biodiversity. 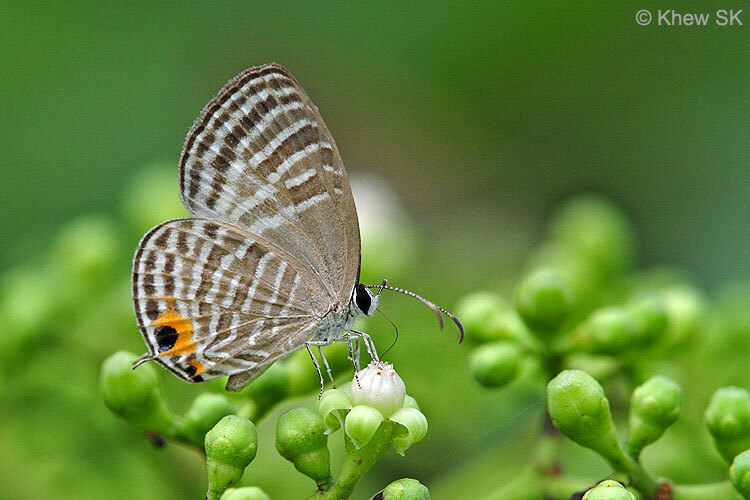 This event celebrates Singapore’s natural heritage and in doing so, hopes to bring about greater awareness of the biodiversity that Singapore has. FOB 2014 had special thematic focus, which highlighted Pulau Ubin, Singapore's island biodiversity and conservation efforts. This year also saw an emphasis on our marine biodiversity. At about 11am, the Guest of Honour, President Tony Tan arrived, and was greeted by members of the biodiversity community. 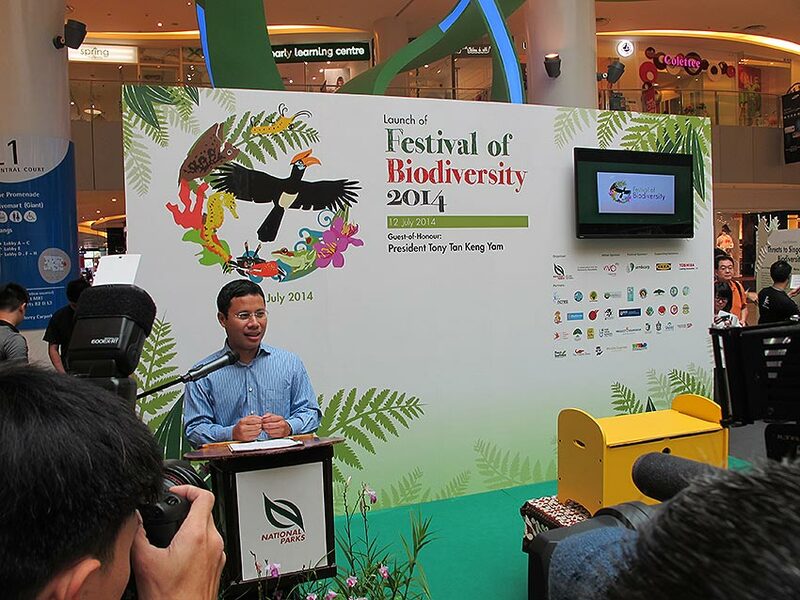 The Master of Ceremonies welcomed everyone and invited the Minister of State for National Development, Mr Desmond Lee to deliver his opening address. 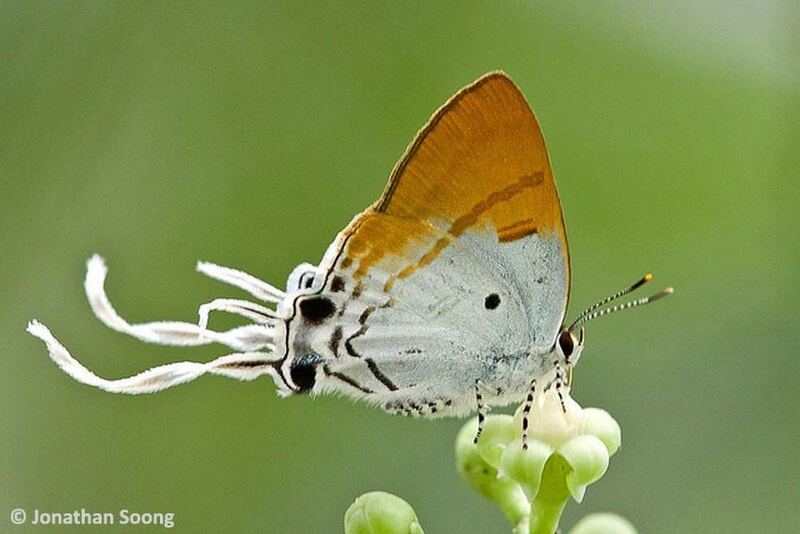 This year, the highlight of the FOB was the announcement that Singapore will establish its first ever marine park! The Sisters' Islands Marine Park, which will span about 40 hectares around Sisters' Islands and along the western reefs of both St John's Island and Pulau Tekukor, will serve as a platform for outreach, educational, conservation and research activities related to our native marine biodiversity. 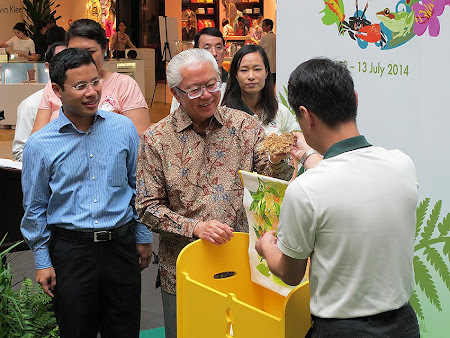 President Tony Tan then launched the FOB 2014 by unveiling a treasure chest of nature wonders containing seedlings and various specimens representing Singapore's biodiversity. 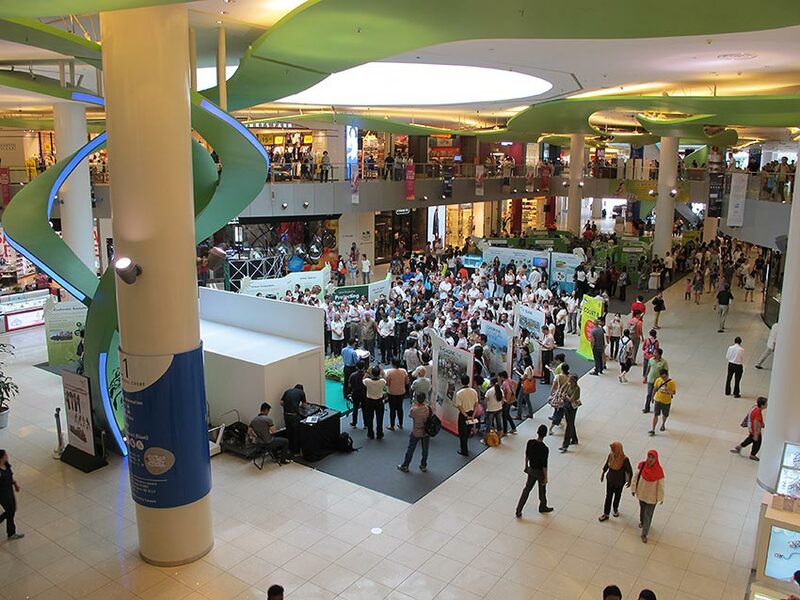 The President then toured the exhibits and visited various NGOs and partners' booths. The President visited ButterflyCircle's booths and chatted with us on our group's activities and the conservation of butterflies in Singapore. 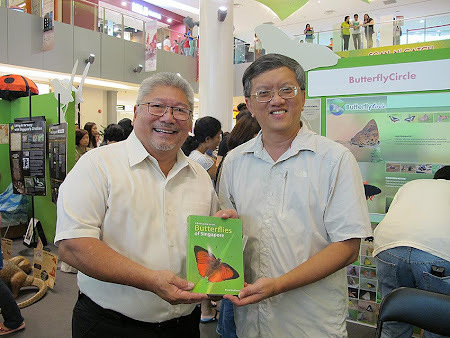 I presented the President with a copy of ButterflyCircle's A Field Guide to the Butterflies of Singapore. Our Minister of State, Mr Desmond Lee, and the CEO of NParks, Mr Kenneth Er, also visited our booth and gamely posed for a group photograph with ButterflyCircle members. Thank you, Desmond and Kenneth, for your support and appreciation of ButterflyCircle's efforts! It was an interesting and tiring first day of the FOB 2014, as we met old friends and made new ones, with every one having a common appreciation and respect of Singapore's awesome biodiversity. For those who have yet to visit the FOB 2014, do come to VivoCity tomorrow (Sunday 13 Jul) and experience for yourself, the amazing biodiversity that can be found on our little red dot! 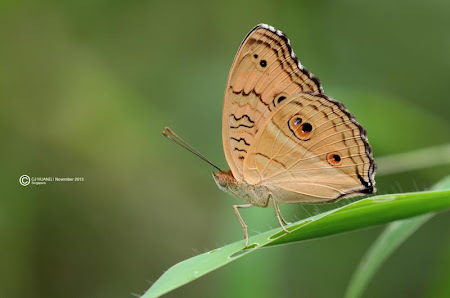 Text by Khew SK : Photos by various ButterflyCircle members. Special thanks to ButterflyCircle members who volunteered to man our booth and who turned up to support us - Goh EC, Brian Goh, Loke PF, Nona Ooi, Huang CJ, Simon Sng, Jerome Chua, Anthony Wong, Mark Wong, Chng CK, Horace Tan, Federick Ho, Nelson Ong, Ellen Tan & Jonathan Soong. Come visit the FOB 2014! 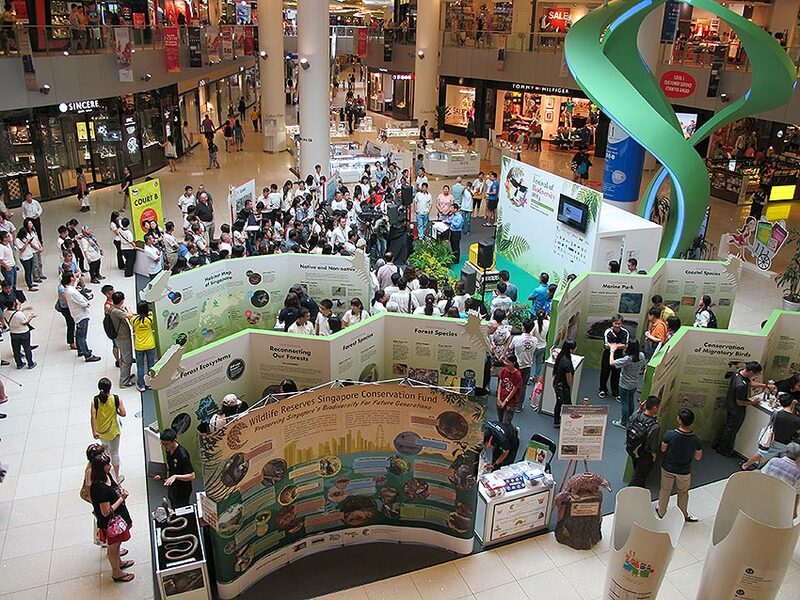 This weekend, 12-13 Jul 2014, the Festival of Biodiversity will be held at VivoCity mall. 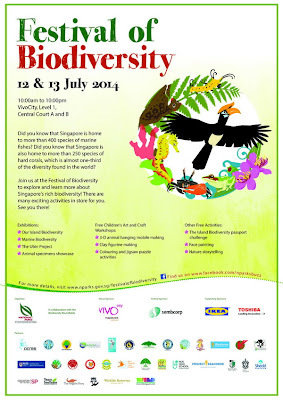 Join us as we showcase Singapore’s impressive and unique array of island biodiversity. 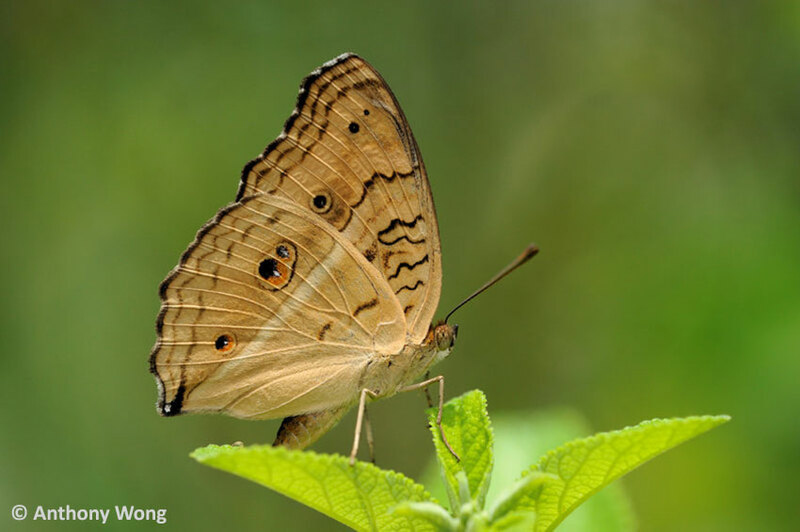 This event celebrates Singapore’s natural heritage and in doing so, we hope to bring about greater awareness of the biodiversity that Singapore has. 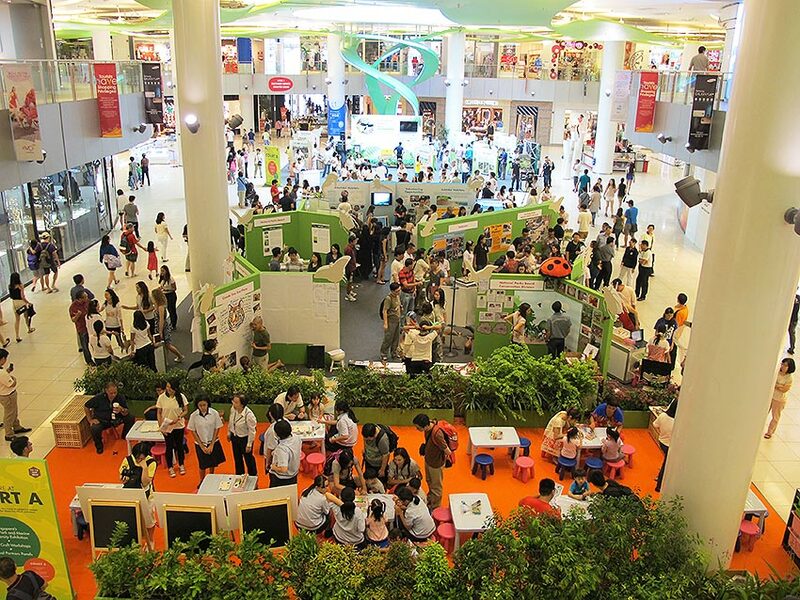 Visitors can look forward to a range of interactive workshops and exhibitions at this year’s Festival. 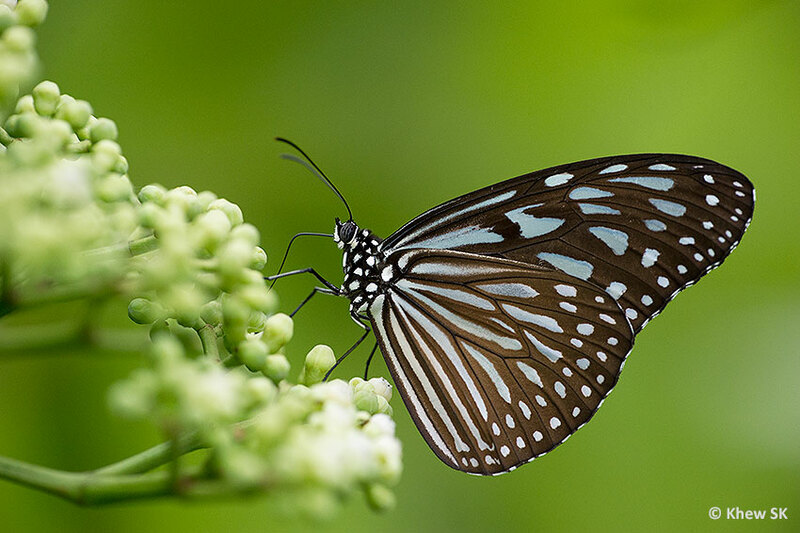 Come visit ButterflyCircle's booth at the exhibition! 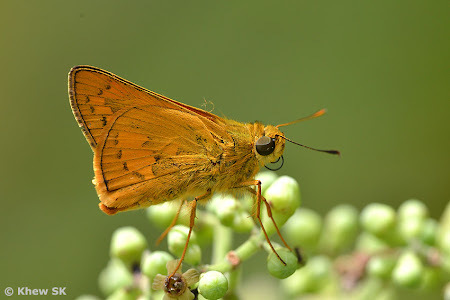 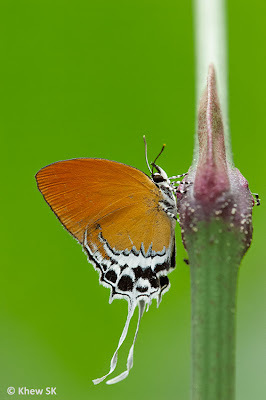 The Chestnut Bob is a skipper that is widespread in distribution around Singapore. As one of its caterpillar host plants is the ubiquitous "Cow Grass" (Axonopus compressus) that is the main species of grass planted along road verges, school fields and urban garden spaces in Singapore, the butterfly is common. The shot above, taken by ButterflyCircle member Loke PF, features an aberrant Chestnut Bob, which lacks the usual white spots on its wings. 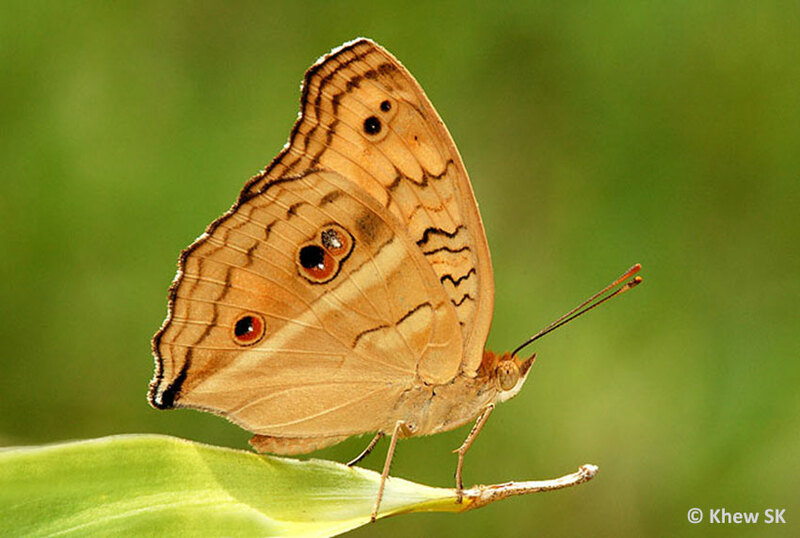 Aberrations occur occasionally in some species of butterflies where the markings on the wings are atypical of a standard example of the species. 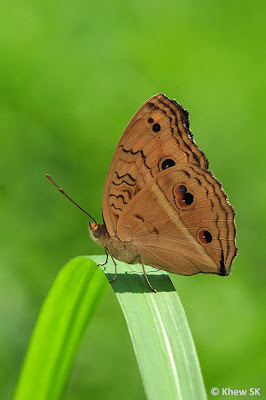 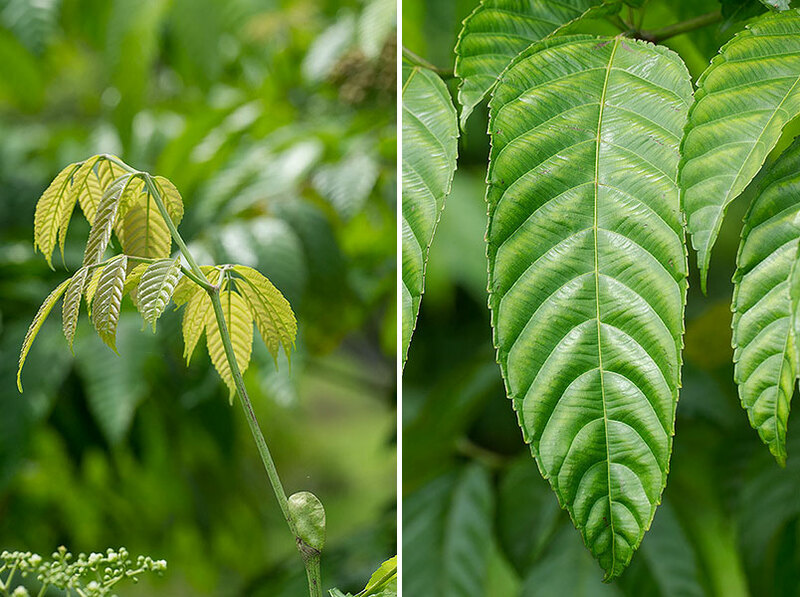 The shot above shows a typical Chestnut Bob with its usual complement of white spots on both the fore and hindwings, and darker brown patches at the post-discal area of the hindwing. It is not known for certain what processes during the early stages of the butterfly cause the aberration. The medium sized skipper was a new discovery for Singapore when it was first recorded some time back from Sungei Buloh Wetland Reserve. It is fast-flying, like most skippers and zips around rapidly when feeding at flowers. It has pale yellowish-white hyaline spots on the forewings and a distinctive spot at space 1b of the forewing. 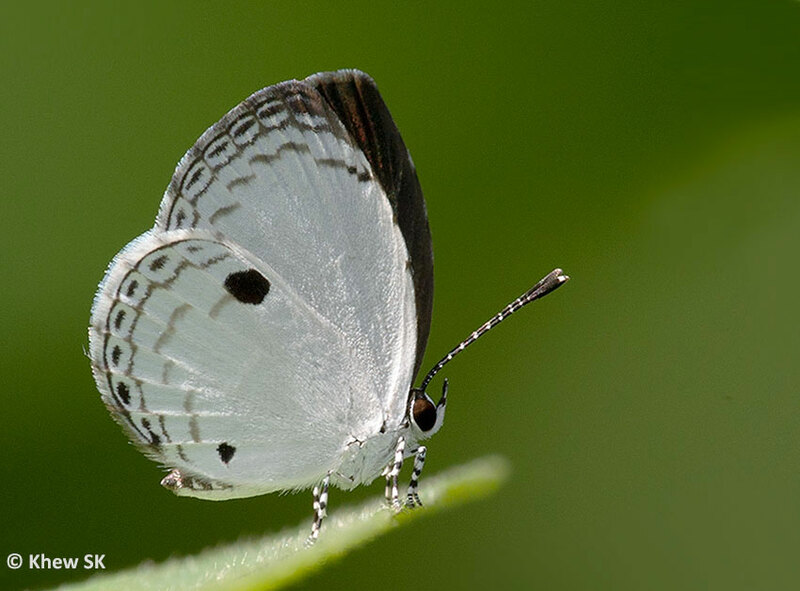 The two cell spots on the forewing above are separated. This large individual was shot last weekend at the newly opened Jurong Eco Garden near the Nanyang Technological University (NTU). 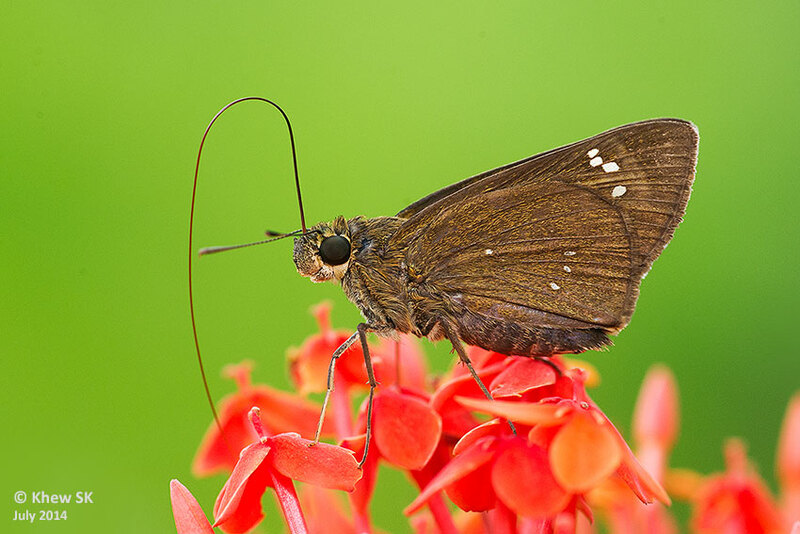 It was moving quickly around the Ixora flowers extending its long proboscis as if it were fly-fishing, and each time accurately hitting the mark to feed on the nectar from the flowers.